The original Vive bundle has also received a $100 price cut today. Once staunch rivals in high-end VR, it now seems Facebook-owned Oculus and HTC are treading different paths. While Oculus is gearing up to launch a more affordable standalone headset, HTC has gone in the opposite direction with the Vive Pro, a new top-of-the range facehugger announced at this year's CES. Today, HTC has revealed the Vive Pro is the antithesis of affordable at $799/£799, and that it's now available to pre-order globally ahead of its April 5th shipping date. For that significant wad of dough, you're getting higher-res OLED displays with a combined resolution of 2,880 x 1,600, up from the Vive's 2,160 x 1,200. In addition to a sharper image, the headset promises more immersive sound through new built-in headphones with 3D audio and noise cancelling features. The Vive Pro should be more comfortable to wear, too, thanks to a redesigned strap that distributes the weight of the headset more evenly across your noggin -- much like the Deluxe Audio Strap for the original Vive does. The Pro also includes dual, depth-sensing cameras on the front, the full potential of which is yet to be realized. 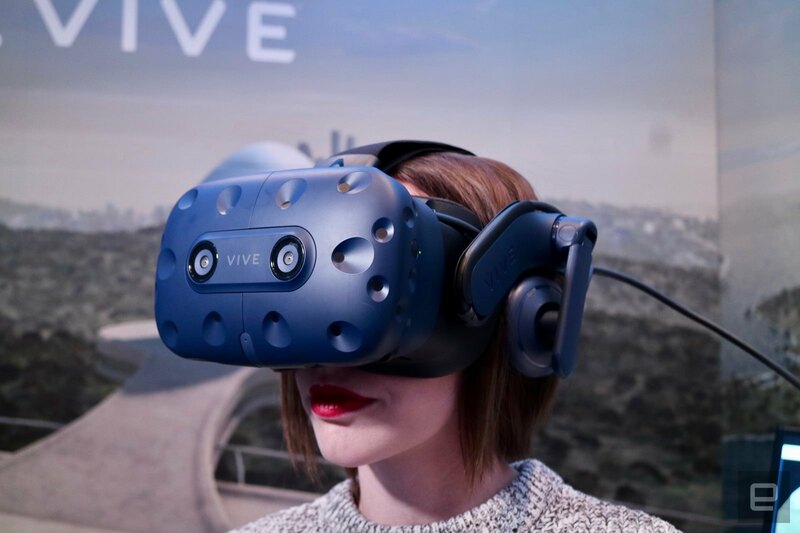 At $799 for just the headset, the Vive Pro is aimed at consumers wanting to be on the bleeding edge of VR hardware. It works with the existing Vive controllers and base stations for room-scale tracking (SteamVR Tracking versions 1.0 and 2.0 are supported), so no need to double up on peripherals if you already have them at home. If you pick up a Pro before June 3rd, you'll get the added bonus of a free six-month subscription to Viveport (the monthly price of which increases by a coupla bucks in a few days, remember). After this time, as is the current offer, you'll get just two months of all-you-can eat experiences thrown in, as well as the free copy of Fallout 4 VR every customer receives. The Vive Pro isn't meant to replace the existing Vive headset, but to reflect the fact there's a new generation of hardware in town, the original Vive bundle (which includes controllers, base stations and other accessories) is being reduced by $100 to $499 -- those outside the US will see an equivalent discount in their local currency. When HTC revealed the Pro at CES, it also showed off the Vive wireless adapter, which uses Intel's WiGig tech to free you from the tyranny of tethers. There's no word on when that might be available today, though, so for now you're still tied to your PC even if you believe you're in another world.